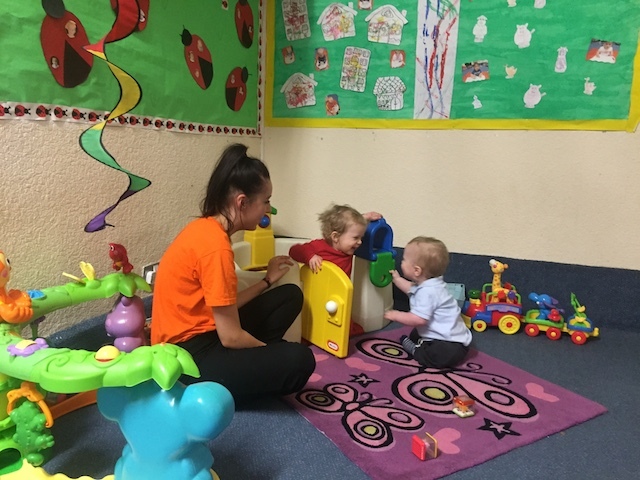 Our Baby rooms cater for children aged 10 weeks to 2 years within two Home Rooms known as Ladybird 1 for our none walkers and Ladybird two for those who are up on their feet and taking steps. With a staff to baby ratio of 1:3 our baby rooms are the most intimate and cosiest rooms. From day one we build good relationships with our parents and carers, working to your routine for your individual child. Not only do we keep you informed verbally every day, but we keep a daily diary to let you know what we have been doing during the day, what and how much your child has eaten, sleep patterns and nappy changes. The babies have every opportunity to roll, crawl, sit, climb, balance, reach, grasp and throw in this spacious and light room. The room also incorporates a cosy corner for ‘Quiet Time’ where the babies can relax and marvel at the wonders of the world. The room is equipped with its own nappy changing area and access to a separate private sleeping room allowing babies to relax and rest whenever they need. This sleep room is monitored by a cot monitor staff physically checking every five minutes so we can closely monitor the children as they sleep. The room is also temperature controlled for the babies comfort. For our small babies we have two six-seat prams known to us as our “Walking Buses” which allows staff to take the little ones out for a walk. 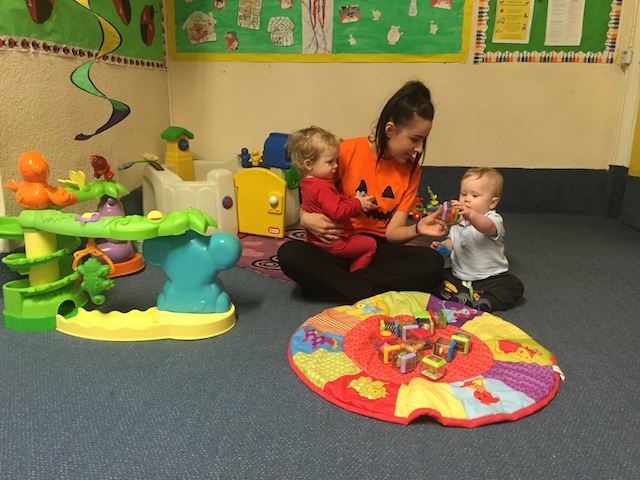 For those Babies that are crawling or up on their feet we also have an out door soft padded area where they can crawl and explore the many choices of toys and equipment that we have to enhance each child’s physical development. All our meals are made fresh every day and cater for all faiths, allergies and each stage of weaning. Menus are displayed throughout the building. Here the babies have chance to rest in a quiet tranquil environment. Each child is allocated a cot with their own bedding and any comforters they require. This sleep room is monitored by a cot monitor, staff physically checking every five minutes so we can closely monitor the children as they sleep. The room is also temperature controlled for the babies comfort.